Clean water and healthy oceans are definitely high on our list of priorities, but if we can’t get to the coastline to enjoy ocean activities, then we’ve got a major problem to solve. Limited access to the shoreline is how the organization started in 2006 and to this day it is the most important (but probably least understood) issue that we work on. What started as a simple program related to knocking down obstruction barriers has evolved into an effort that includes topics such as erosion, sea-level rise, invasive species and long term shoreline planning. Here are our current projects. If you would like to get involved in monitoring public access to make sure it lasts forever, or to learn more about opportunities to make a difference, click here. 23 rights of way exist in Newport and some are at risk with fences appearing in new places, waterfront development taking away access and other that have an ocean view but no way of getting in the ocean. As sea level rises (or sinks) we need to make sure access to the coastline remains. We monitor all rights of way twice monthly. To date, we have adopted 23 of the rights of way and are actively working on designation of the 24th right of way. 10 rights of way exist in Middletown and some are at risk with fences appearing in new places, waterfront development taking away access and other that have an ocean view but no way of getting in the ocean. As sea level rises (or sinks) we need to make sure access to the coastline remains. We monitor all rights of way twice monthly. To date, we have adopted 7 of the rights of way and are actively working on adopting the remaining locations. 17 rights of way exist in Portsmouth and some are at risk with fences appearing in new places, waterfront development taking away access and other that have an ocean view but no way of getting in the ocean. As sea level rises (or sinks) we need to make sure access to the coastline remains. We monitor all rights of way twice monthly. To date, we have adopted 0 of the rights of way and are actively working on adopting the 3 locations along Common Fence Point as a pilot program and then expanding to the rest of the rights of ways. We are also planning to work with the Portsmouth Harbor Commission to migrate legacy data into a cloud based solution for the non-CRMC rights of way to further the collective efforts to establish new rights of ways in Portsmouth. A 3.5 mile stretch of coastline that has primitive ruggedness and natural beauty that must be protected. This is also a huge tourist attraction so safety is a big concern, however it can’t be done at the risk of compromising any of the coastal feature. We are active in the cliff walk commission and stay current with all projects to make sure public access (which is not the same as a cliff walk) is preserved. Large parcels of land on the west side of the island are undergoing significant environmental remediation led by the United States Navy with oversight from the EPA and DEM. The land between Cypress Street in Newport and Anthony Road in Portsmouth do not have any CRMC designated rights of way. We are interested in making sure the remediation work is done such that the watershed, coastline and nearshore zone are available for residential use with most land being preserved. At the same time, any development of the west side of the island must be done to create ample CRMC designated rights of ways. The public has used this coastline for generations, we can’t lose it. We are a part of the coalition of community leaders for the creation of the BEACH SAMP working closely with CRMC and NGO’s in Rhode Island. This is a state wide effort and our focus is on the shoreline area management plans related to Aquidneck Island, however we stay current with activities off-island. At every chance we get, we attempt to integrate “ACCESS” education into the education programs of “CLEAN” and “OCEAN”. 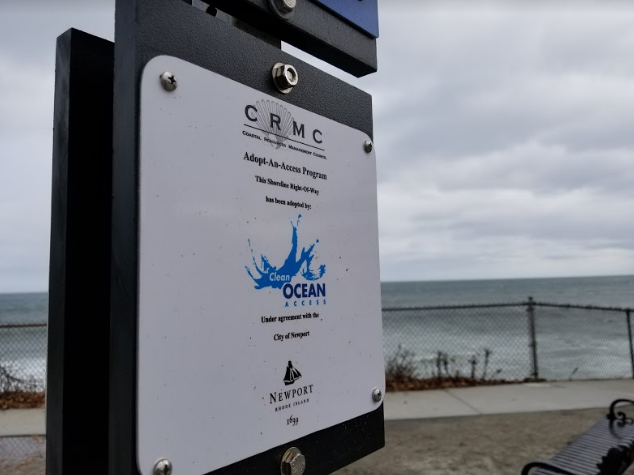 Informing the next generation of ocean enthusiasts about the importance of protecting, preserving, maintaining and expanding shoreline access is a critical next step so that our shoreline access remains in place forever. With all of the efforts listed above we put effort into outreach to share these opportunities with the community, via social media, website posts, media advisory, press releases, letters to the editor, earned media, paid media and other channels of communication. A HUGE part of ACCESS program is data processing and disseminating this information. After each monitoring process (1200 per year!) we log the data, collect results, and take necessary action. “Passion doesn’t influence policy, but data does!” So, we collect massive amounts of data to influence change. To see our complete results, visit our reports page.